Yep, this week's we're getting sketchy with one of our favorite lovely guest stars ... the talented and always amusing Allison Fillo. Allison manages a team of writers, trainers and curriculum developers by day and wild jackals by night (aka her children Tristan, Charlotte & Avery). 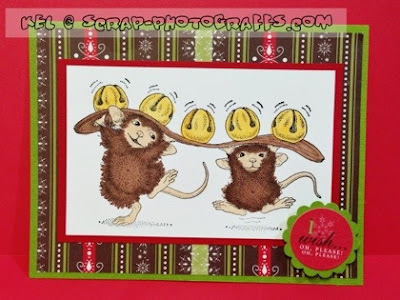 When she does get to venture into her craft room, she enjoys cardmaking, scrapbooking, and designing periodic sketch challenges for lucky souls like us at Jingle Belles. 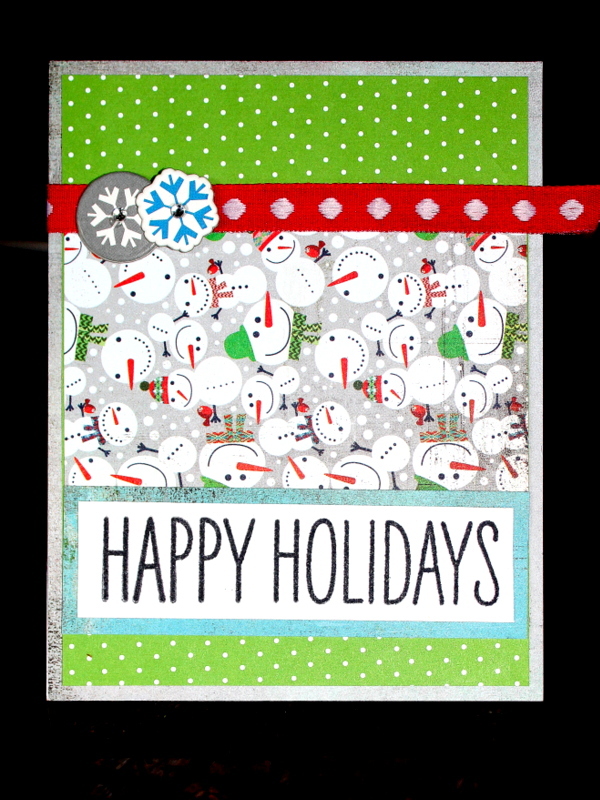 Allison combined some of our favorite wonky snowman paper with pretty holiday ribbon, snowflakes and happy polka dots ... so festive and fun. 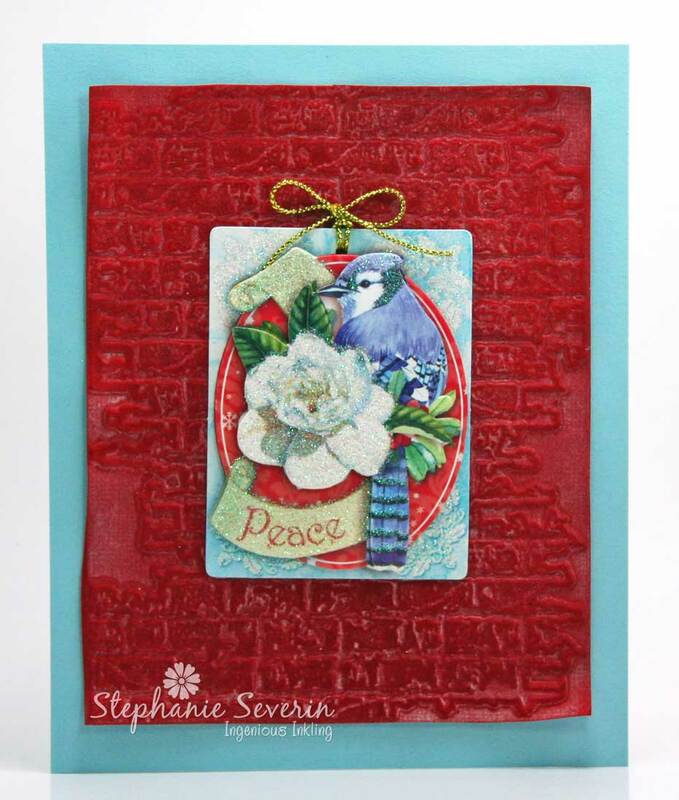 Stephanie says, "I cut into some of my favorite papers from My Mind's Eye I Believe Collection to start my card. When I attached my top panel to my card base, I realized it was wider than I wanted, so rather than throw it away, I flipped the sketch moving my Hero Arts sentiment to the top for better balance. 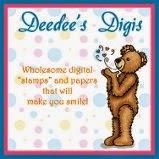 I love my new little Sweet Petites Bells from Die-versions." 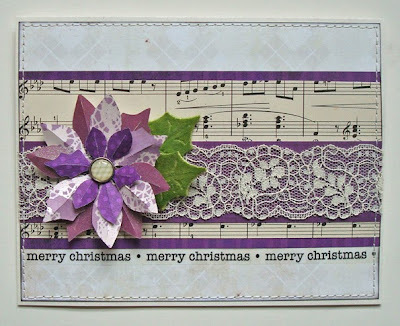 Lauren says, "I constructed my card using scraps, which just happened to look better on the horizontal than the vertical, so I took Allison's gorgeous sketch and went W*I*D*E with it! 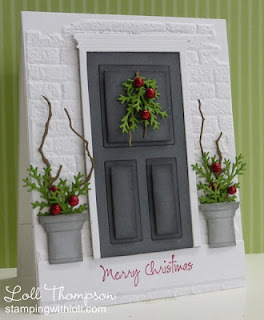 The diecut poinsettias were also leftovers, so I let them dictate my choice of accent colors. a little vintage sheet music, a scrap of lace, some machine stitching to make sure ALL the layers stay put... et voila!" And now we cannot wait to see what you create using Allison's fabulous holiday sketch ... we hope you have fun creating. Make sure you link-up here before 6pm (EST) on Wednesday, September 11th. Keyword for the Jingle Belles Flickr Group (and other galleries) is JB:13:18. And we'll even send a few little Christmas goodies to one lucky participant. 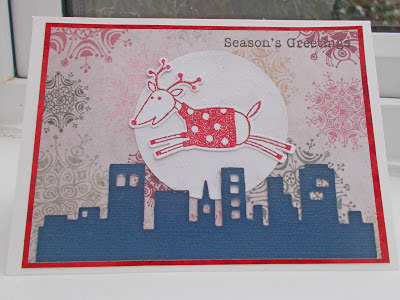 Turned heat embossing, ribbon and stamping into this inky, sparkly, utterly fabulous masterpiece! 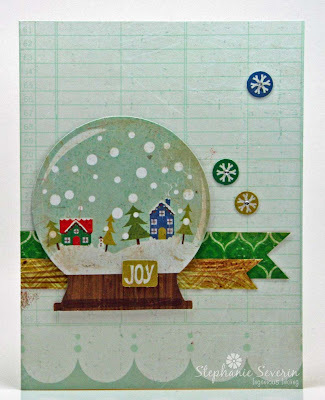 Took die-cutting, a traditional red and green color scheme, and embossing to previously un-dreamt-of levels of elegance! Lauren says, "I went straight down the middle this time... literally... by choosing the center column of Glitter/Bling + Red/Green + Santa. 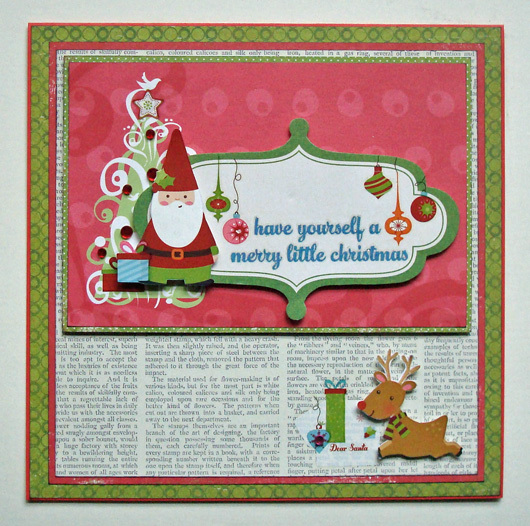 The adorable Imaginisce rub-ons did most of the work for me, I only needed to add some pretty red and green papers, a glittery sentiment rub-on, and a few tiny red rhinestones... et voila: I'm another card closer to a stress-free December!" Stephanie says, "I must confess, I did another double tic-tac-toe this week (those who know me are not surprised). I went diagonal using die cuts from Crate Paper's Peppermint collection ... both red & green ... and wood grain dry embossing on my bottom banner. I also scored a tic-tac-toe across the top with itty bits of bling in the middle of my snowflakes ... and the tiniest little snowman I've ever seen inside the snow globe. 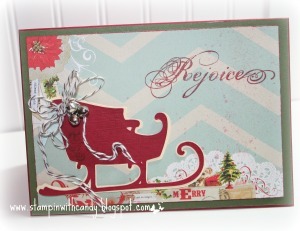 The layout is this week's Sweet Sunday Sketch Challenge." Remember to link-up before Wednesday at 6pm EST. 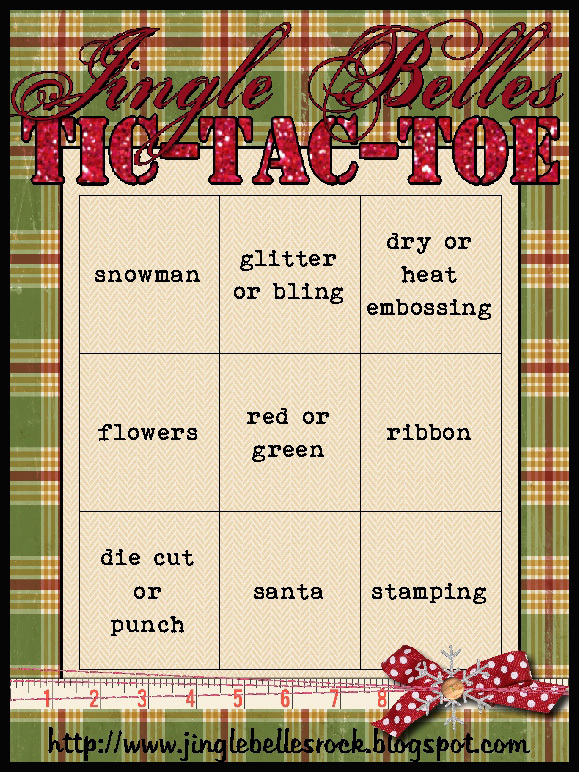 You know how this works: just pick any column, row, or diagonal on our special ♥JINGLE BELLES♥ tic-tac-toe board, and incorporate all three items into your holiday card! Stephanie says, "My Tic-Tac-Toe is across the top (technically my little ticket corner punches qualify me for one of the diagonal rows as well). 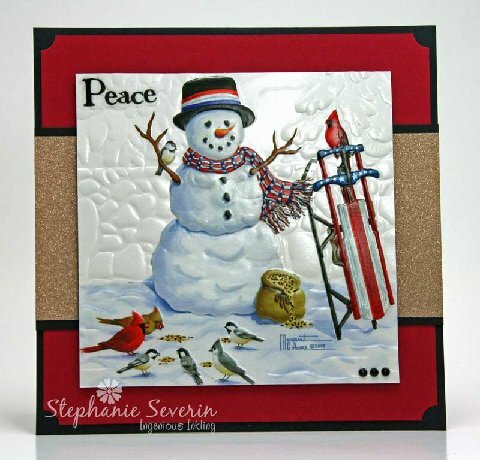 The recycled card base has beautiful dry embossed texture and includes a patriotic snowman design that will be perfect for several people on my holiday card list. I've also included gorgeous gold glitter paper from DCWV (If you haven't tried this stuff you should ... all of the glittery sparkle with absolutely no mess). I finished with a little bit of black bling in the corner." Lauren says, "I didn't consciously set out to *MATCH* the tic-tac-toe board, lol, but I did create these two items back to back, and it just sort of happened! Of course, you needn't incorporate ANYTHING from the board except whatever three consecutive items are in your row or column. 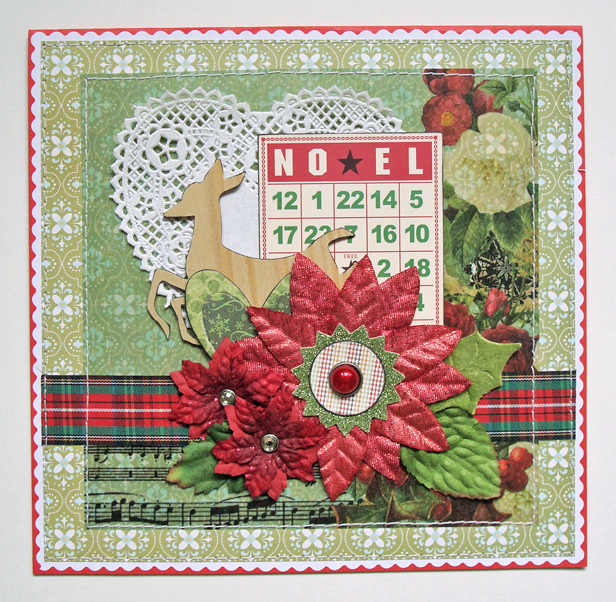 I chose the middle horizontal row, so I've got an abundance of xmassy flowers, the color red or green (ok, BOTH, actually!) and some fabulous plaid vintage ribbon I pinched from my mother's sewing room... shhhhhh... don't tell, ok?! I used the current layout from Feeling Sketchy to guide my design." 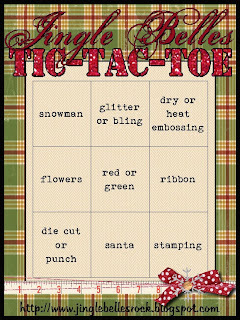 And now we cannot wait to see what ♥YOU♥ will do with our Christmas Tic-Tac-Toe! Pick a row, any row; get crafty... and be sure to link up here before 6pm (EST) on Wednesday, August 28th! Keyword for galleries and the Flickr group is JB:13:17. Made a scene... in the best possible way... by giving us a glimpse inside this lovely and very clever window! Invites us to spend the holidays in this idyllic winter wonderland... complete with sparkly snow! Opens the door to elegance and serenity in her divinely devised design! We're still celebrating Home for the Holidays this week at Jingle Belles. Here are our second round of cards made using this prompt. Stephanie says, "I thought a brick wall would be a great starting point for a holiday card design. 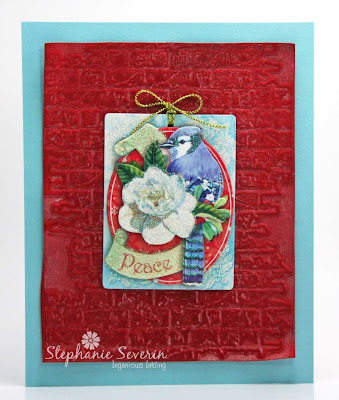 I found some red velvet paper in my stash ... and the crushed velvet embossing produced a fantastic textural effect (not to mention the tiny big of white ink residue that was still on my folder from the last time I used it ... love those happy accidents). I attached the velvet embossed paper using strong two sided tape adhered about 1/2 inch in from the edges, so the corners would curl slightly for a bit more dimension. 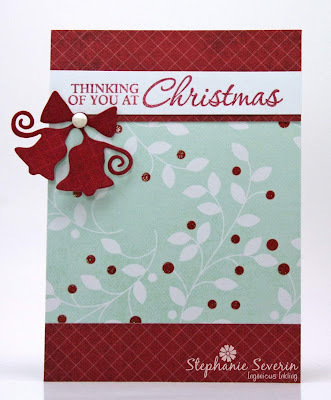 The finishing touch is a 3-D glittery gift tag I picked-up at the after Christmas sales last year ... a wonderful holiday centerpiece." Lauren says, "I made this (slightly reduced) copy of one of my favorite vintage Christmas postcards last week, intending to use it then; but for some reason I couldn't quite make the design work. In the meantime, I had a little splurge on holiday goodies at Crafty Steals, and my new Studio Calico and October Afternoon papers saved the day! Don't you just ♥LOVE IT♥ when that happens?!" 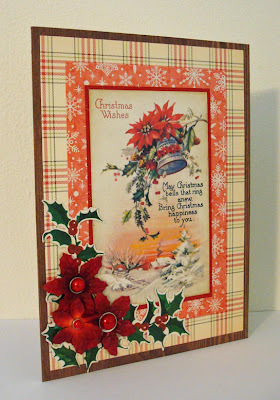 Remember, link-up your Home for the Holidays cards by 6pm EST on Wednesday, August 14th. Lauren says, "I'm pretty proud that I managed to (somewhat accidentally!) 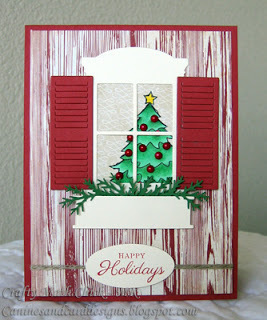 work in all three elements of the prompt this week: Adorable die-cut house? Check! Rub-on sentiment which includes the word 'home'? You betcha! Woodgrain-patterned cardstock? Ok, yeah, it's rather subtle in the background, but it is there! Multiple missions accomplished!" 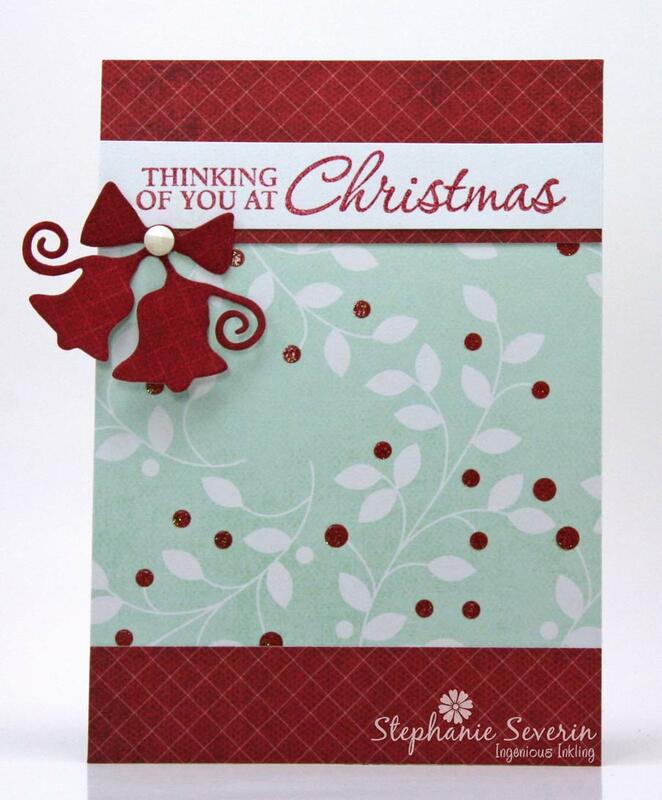 Stephanie says, "I love my peaceful card design that for me evokes the feeling of being safely tucked in at home for the holidays. 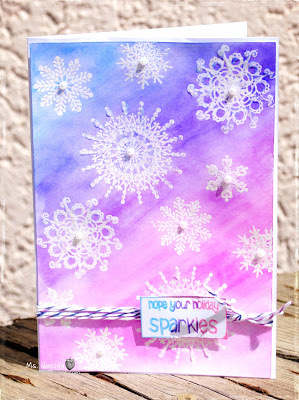 I used a 4"x 8" horizontal card design, so I could feature as much as possible of this wonderful glittery snowy house border sticker. 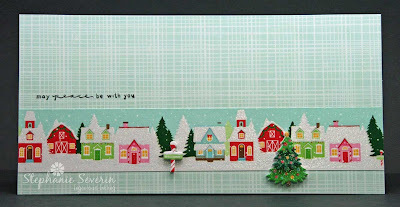 I added 3-D Christmas tree & North Pole stickers, together with a tiny stamped peaceful sentiment from A Muse ... AND all of it was put together on a piece of designer paper from my scrap bin (love when that happens). So whether it's Santa's House at the North Pole ... or a cozy Gingerbread House ... or wonderful wood-grain paper ... we can't wait to see what you create. 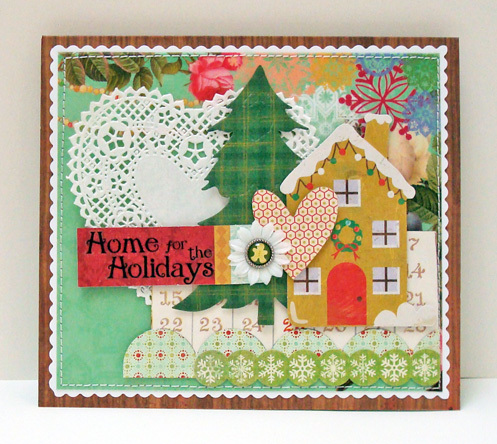 Link your Home for the Holidays card up by 6pm EST on Wednesday, August 14th. Keyword for galleries and our Flickr Group is JB:13:16. 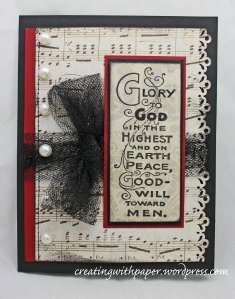 Used sheet music to perfection (not to mention tulle, pearls and an awesome sentiment stamp) in her simple yet dramatic card! Rocks the sleigh (as well as super-cool jingle bell brads, twine and gorgeous paper) in a way that definitely makes us rejoice! Had her two adorable little friends bring us these sleigh bells, on a card so appealing *we* wish it was destined for us! 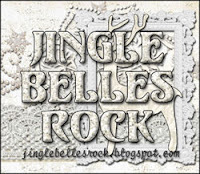 Please email us at jinglebellesrock @ hotmail [dot] com to claim your prize! 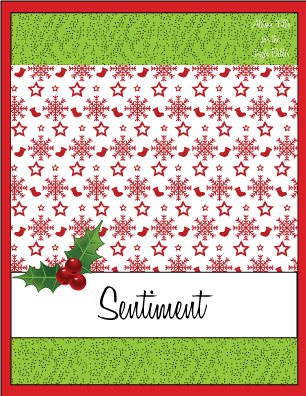 Once again we thank everyone who played along; and we especially thank the lovely and talented Jessi Fogan for devising this fun prompt and making such gorgeous cards to inspire us all! We'll be back at midnight with more homegrown fun and hijinks. Won't ♥YOU♥ join us then?